Below, we’ve listed a full itinerary for your second day in Hong Kong. To plan your first day, use our Hong Kong 1 Day Must See Itinerary, which provides a full itinerary for your first day in the city. Our second day itinerary starts with a trip to Lantau Island, where you can visit the Po Lin (Precious Lotus) Monastery, ride the Ngong Ping 360 cable car and view Hong Kong’s famous Tian Tan Buddha. You’ll want to leave Hong Kong at about 9:30am for this trip, as Ngong Ping 360 starts operating at 10am. Lantau Island is Hong Kong’s largest island. Located east of Hong Kong Island, it’s connected to the city’s MRT network. Unlike Hong Kong Island, Lantau Island is much less heavily developed and offers a great break from the noise and activity level of Central Hong Kong. Getting to Lantau Island from Hong Kong is quick and easy. From Hong Kong station, take the Tung Chung (orange) MTR line to Tung Chung station. From Tsim Sha Tsui, cross the harbour by ferry or MTR, then take the same route from Hong Kong station. The most exciting way to access the Tian Tin Buddha and Po Lin Monastery is using the Ngong Ping 360 cable car. 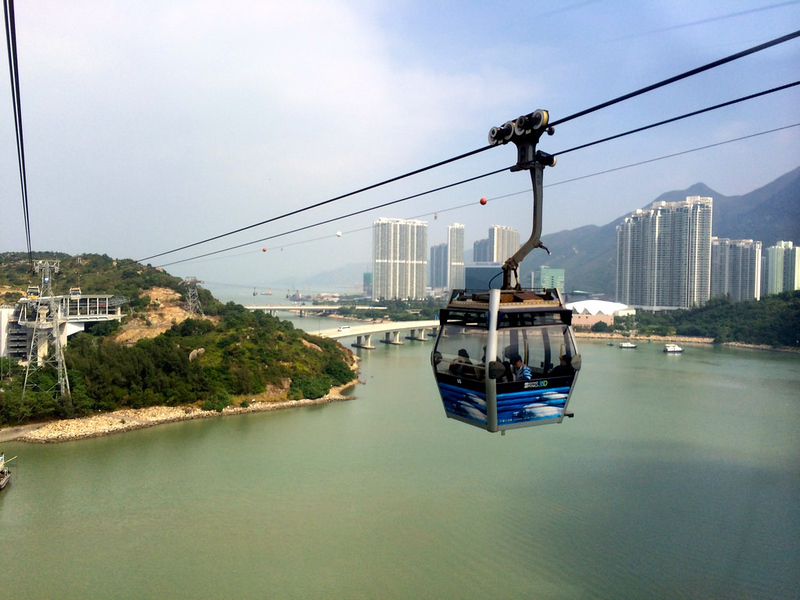 The cable car starts operating at 10am daily and takes about 25 minutes to reach Ngong Ping village. Expect big queues for tickets if you visit Ngong Ping on a weekend or public holiday. One way to avoid the queues is to book your Ngong Ping 360 tickets online before you arrive. Tickets go on sale two weeks in advance, making it easy to take care of this part of your trip ahead of time. Another easy way to avoid the queues is to book a ticket on the glass bottom cable car instead of the regular car. People with a fear of heights might want to skip this option and just book the regular cable car tickets online. The cable car will drop you at Ngong Ping Village after an incredible ride through some of Hong Kong’s most impressive scenery. Once you’re there, it’s best to get out of the village quickly (it’s a major tourist trap) and head to the Buddha statue or monastery. Constructed to symbolise the harmonious relationship between humans and nature, Tian Tan Buddha is a 34 metre tall Buddha statue located a short distance from Ngong Ping. You’ll be able to spot the statue as you ride the cable car into Ngong Ping Village. The statue is located at the top of 268 steps, making it something of an adventure to reach. It’s easy to access the Tian Tan Buddha statue from Ngong Ping Village — just follow the signs after you arrive on the cable car. Named after the Temple of Heaven in Beijing, the statue incorporates several aspects of the famous temple’s design into its base. After walking up to the statue, you’ll be rewarded with a pleasant view of Lantau Island. Founded in 1906, Po Lin Monastery is a Buddhist monastery that’s located a short distance from the Tian Tan Buddha. While most visitors come inside to make an offering or say a prayer, you can also stop by for a quick and tasty lunch. The vegetarian restaurant near the temple serves good, fairly priced food and makes for a pleasant refreshment stop after walking up to the Tian Tan Buddha statue. If you’re in the mood for a short hike or simply want to get away from the numerous tourists at the Tian Tan Buddha and Po Lin Monastery, you’ll enjoy walking along the Wisdom Path — an easy but interesting hiking trail located a short distance from Ngong Ping Village. The Wisdom Path features large columns with verses from the Heart Sūtra carved into them, with some nice views over Lantau Island’s dense forest and mountainous scenery. The entire walk only takes 15 to 20 minutes, giving you a refreshing break from the crowds. 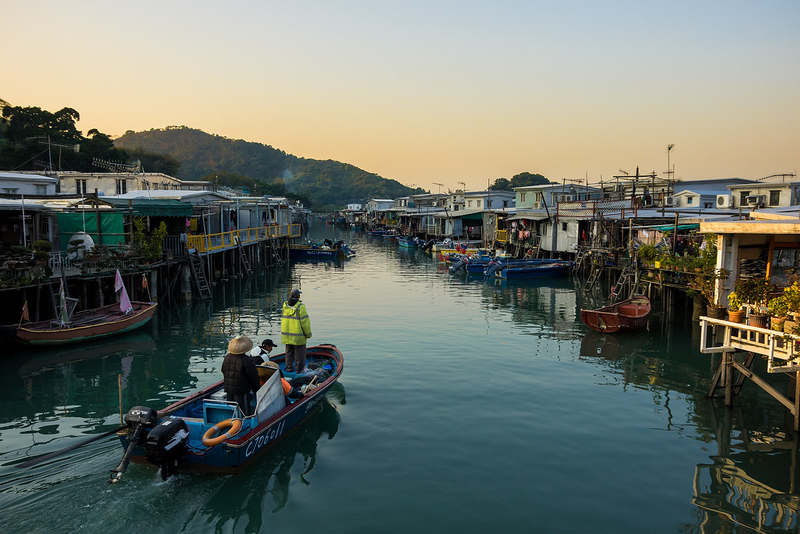 The afternoon of our second day itinerary includes a trip to Tai O, one of Hong Kong’s relaxing and peaceful seaside villages. On the way back into Hong Kong, you can stop in Mong Kok and enjoy a throwback to Hong Kong’s old days as a bustling and busy budget trading hub. After visiting the Tian Tan Buddha and Po Lin Monastery, you can extend your time on Lantau Island by making a trip to the small fishing village of Tai O. Famous for its excellent seafood and stilt houses, Tai O is also a great place to stop for a fresh seafood lunch. The village is easy to access from Ngong Ping — just take bus 21, which comes every hour, to get there in 15-20 minutes. Tai O is home to a great selection of local seafood restaurants, most of which offer a mix of fresh seafood and regular Cantonese food. You can also drop by Solo, which is a local café with great views over Tai O’s famous stilt houses. The key attraction in Tai O is its relaxed pace of life, which couldn’t be more different than Hong Kong’s bustling central districts. You can also visit the local specialty market while you’re there for a look at what Hong Kong was once like before it transformed into a major economic hub. From Tai O, it’s easy to get back to Ngong Ping Village by bus. Once you get to Ngong Ping, it’s a short cable car ride back to the nearest MTR station and Hong Kong. If you’re feeling tired after spending the day exploring, you can head directly back to Central or Tsim Sha Tsui from Ngong Ping using the MTR. 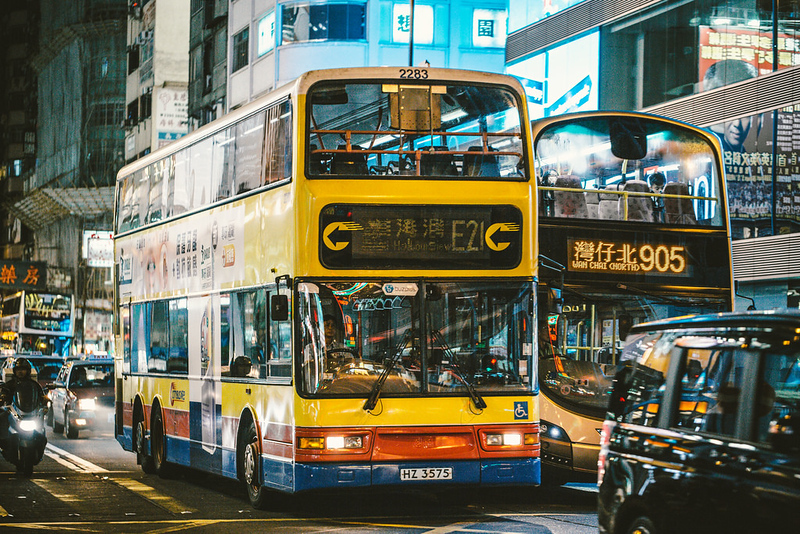 If you’re still in the mood for sightseeing, a stop in Mong Kok on the way home is a fun way to see the round-the-clock busy side of Hong Kong. Mongkok is one of the world’s most densely populated areas — a small, crowded and perennially busy shopping, business and residential area that’s been described as the busiest district in the world by Guinness World Records. If you’re not a fan of hustle and bustle, you’ll probably want to avoid Mong Kok. However, if you feel like shopping for all sorts of cheap souvenirs, clothes and gadgets in an area that’s uniquely Hong Kong, stopping in Mong Kok for an hour or two is definitely worth it. Mong Kok is easy to reach using the MTR. From Tung Chung, take the Tung Chung Line to Lai King station, then transfer to the Tsuen Wan Line towards Central until you arrive at Mong Kok station. Tung Choi Street, or the Ladies’ Market, which is a good place to shop for cheap and simple clothing. Expect all brand names here to be fakes and be prepared to negotiate for at least 30% off the listed prices. Sai Yeung Choi Street, which is full of retailers selling everything from clothing and footwear to consumer electronics. Mong Kok Computer Centre, which is a great place to shop for laptops, computer parts and other consumer electronics. Langham Place, which features an upmarket mall that’s a great escape from the crowds of Mong Kok’s streets. If you didn’t already visit Temple Street Night Market on your first day in Hong Kong, it’s worth popping by for dinner while you’re in Mong Kok. Take the MTR to Jordan, then make the short walk to the night market from the MTR station on Nathan Road. If you already visited Temple Street on your first night in Hong Kong, you can also check out the international dining scene around SoHo, where you’ll find some of Hong Kong’s most popular bars and restaurants. Another good option for international dining and nightlife is Knutsford Terrace, where you’ll find more than 30 international bars and restaurants. Knutsford Terrace is a short walk from Jordan MTR station, making it an ideal place for a drink after visiting Temple Street Night Market. Haven’t booked your Hong Kong hotel yet? You’ll get the best experience by staying in Central or Tsim Sha Tsui, the first of which will put you right in the centre of Hong Kong’s business area and the second of which will give you easy access to Kowloon’s top tourist attractions. One of Hong Kong’s most iconic luxury hotels, The Peninsula Hong Kong opened in 1928 and has been one of Hong Kong’s top places to be seen ever since. Benefits of staying here include stunning harbour views, luxurious rooms and an optional extra Rolls Royce limousine service. The Four Seasons is located right in the centre of Hong Kong’s central business district, a short walk from the MTR. Rooms here are luxurious and extremely comfortable, with great views over Victoria Harbour or of Hong Kong’s incredible skyline. 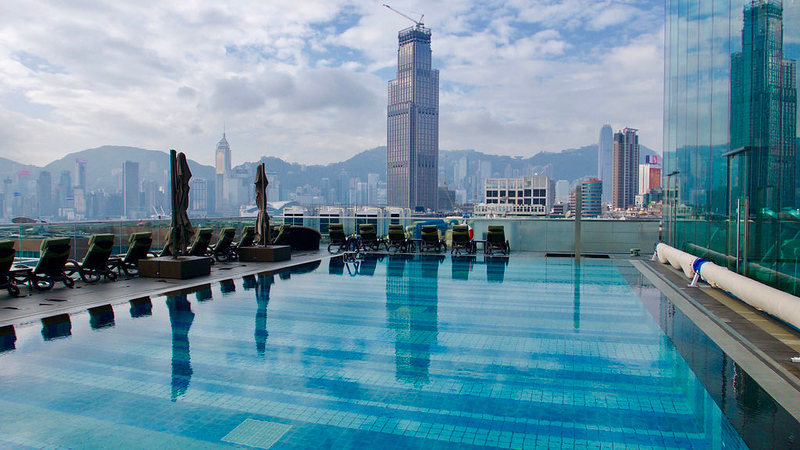 With a great location in Central, this four star hotel on Hong Kong Island is a great choice if you want a luxurious, comfortable room with more space than typical Hong Kong accommodation. Another option from the Butterfly Boutique Hotels group, this mid-priced hotel on Prat Avenue is perfectly located in the heart of Tsim Sha Tsui, a short distance from the MTR and close to many of the area’s best cafés and restaurants. Located inside Haiphong Mansion, this budget hotel offers dorm beds and private twin rooms in the heart of Tsim Sha Tsui at fair prices. Just one stop from Tsim Sha Tsui, Hang Ho Hostel offers inexpensive, clean and extremely cosy rooms in a busy area of Kowloon. A good option if you want to be close to public transportation. Feel Like Staying Another Night? Staying an extra night in Hong Kong will let you see even more of the territory, from impressive beaches to exciting theme parks. If you want to extend your trip, check out our Three Days in Hong Kong intinerary for some extra travel ideas.